What are learning difficulties all about? Learning difficulties can be viewed from many different angles. One approach is to view the topic from the development dynamics of neuropsychological and environmental factors. The point of focus then is adolescents’ cognitive abilities, as well as, an innate vulnerability of self-control and how the individual copes with setbacks. The definition of SEN (special educational needs) is in many countries legally defined in order to decide whether certain individuals are eligible for special educational services. Additional educational needs (AEN) refers both to the needs of students with SEN and to the needs which may be experienced by students from particular social groups , for example, immigrant students. Generally when we talk about learning difficulties we are referring to specific learning difficulties. Those are difficulties when students’ attainment in one specific area is unusually weak in relation to his/her intelligence ability, and that attainment difficulties are not caused by unsatisfactory teaching, sensory disability, emotional or other disabilities. The reasons for these difficulties can be traced back to physiological or functional deficiencies in the brain that have generally emerged during early developmental stages. Typically specific learning difficulties mean significant difficulties in reading, writing and mathematical skills but difficulties can also appear in language development and motor skills. 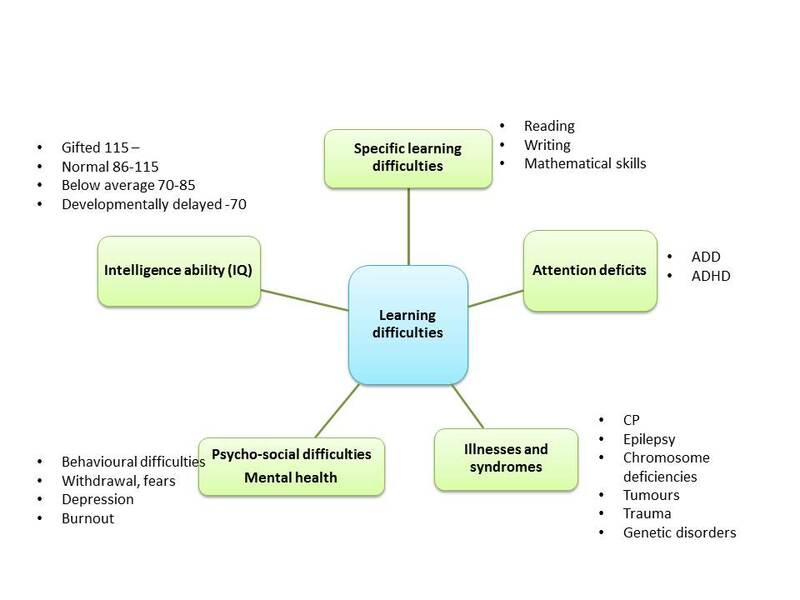 On the other hand, learning difficulties are also linked to various attention deficits. Although diagnosis is made by other professionals, it is important for teachers to recognise specific learning difficulties so that they are able to consider how these difficulties affect learning and how learners can be best supported. In addition to specific learning difficulties students can have other broad spectrum learning difficulties that hinder their everyday life activities. Also an environment can present a number of issues that hinder learning, these could manifest themselves as drug abuse, behavioural and motivational problems or attention deficits. Early diagnosis during early years is important so that necessary and targeted support can be offered or that the environment can be modified to meet the individual’s needs (accessibility). Comorbidity of learning difficulties is common causing difficulties in recognition and diagnosis later in life. Different developmental stages during youth affect how they accept their difficulties. Being a part of the group and belonging are crucial elements in youths’ development and therefore learning difficulties can be hidden. Also adult learners might find it difficult to accept their learning difficulties for example due to experiences of failure. Labelling the learning difficulties of youths and adults should not be the main target. More importantly, learners should be supported to understand their diversity, accept it and find strategies and solutions for learning and everyday life situations. Discussions and guidance offered by tutors are helpful along with peer support. At organizational level the Strategy for Special Educational Needs includes practices for recognising difficulties and offering support. This web site contains learning materials created by JAMK University of Applied Sciences, Teacher Education College. Content has been produced by Eila Burns, Maija Hirvonen and Leena Selkivuori. The content is protected by Creative Commons -licence.